Smiling is important; at least, robots and machines think so. Click through to see sfnal references. Unilever has created a new vending machine for ice cream that will provide its tasty product for free if the customer smiles. 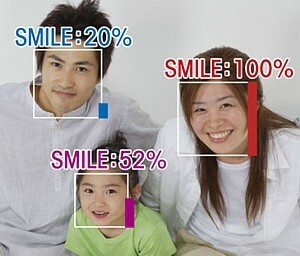 Smile scans performed by automated machines are given daily to workers at Keihin Electric Express Railway in Japan. The facially-expressive Einstein robot has learned to smile using machine learning. This technique comes as a great relief to grad students, who would otherwise be painstakingly programming every last movement of all 31 facial muscles. 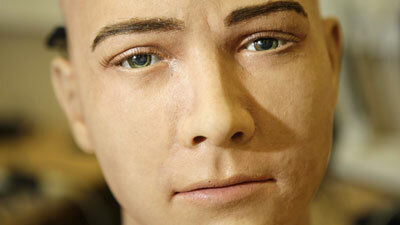 Androgenoid Jules is a humanoid robot that now has a new capability; it uses its own software to match the facial expressions of nearby human beings. Jules' smile is as real as software and Frubber can make it (see video). OKAO Vision, smile recognition software from Omron Corporation, will help us to achieve a goal that will be increasingly important - making sure machines know how we feel.